They provide SEO technology and fulfillment services for organizations from various industries and niches. Their in-house team is able to provide affordable, effective and customizable SEO. At the end we would say SEO means SEMALT for us. Heavy misuse of SEO methods and overuse of keywords in text content. Having started with AutoSEO package the client switched to the FullSEO later. Also they decided to commission an Exclusive explainer video. 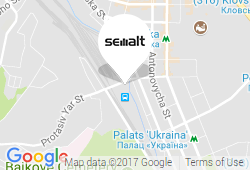 5 mon of AutoSEO, 4 mon of FullSEO. While the project’s main objective is to increase sales via Google organic traffic, we also carry out additional tasks like performing internal and external optimization, improving productivity and helping the website enter the competition on the market, by getting it to Google TOP in the shortest terms possible. First, we ran a semantic analysis of the website’s structure and kernel. Then we divided the promoted phrases into pages according to the website’s structure and began optimizing the webpages under promotion. Initially the website’s loading speed was quite low. It used to take more than 7 seconds to download website's 2mb page. We also have considerably improved engine’s performance, enabled compression, leverage browser caching, optimized heavy images and worked with CSS files to enhance the website’s site load speed. A. Title includes the main keyword only and brand name is not over 65 symbols. B. Description contains basic information about the company’s services and is not above the symbol limit. • Interlinking added – for correct internal linking and link weight distribution we added internal links to promoted pages with keywords within several text pages with articles. We also placed several links in the website’s news and articles to pass the weight to the main page. •We began natural links placing on the niche-related web resources relevant to the website content. The placed links are integrated into unique content, allowing us to achieve perfect results. Semalt base has more than 50,000 high-quality partner sites on various subjects. Sites are carefully selected by domain age and Google Trust Rank. Added text with titles – in order to enhance relevance of the pages to promoted keywords and to increase HTML/text ratio we have added text to the existing text blocks. The text volume increased to 1000+ words on the homepage and 500+ words on other promoted pages. We also removed h1 tags to have proper headings structure. Added relevant content, removed referer spamming. Assisted in creating a successful website promotion plan which includes adding multimedia content. (Exclusive content). Offered to launch extra article writing campaign that brought effective results and client’s gratitude. We used articles on the external platforms, purchased at specialized digital point (DP) forum. A lot of work has been done on internal and technical website optimization and system content marketing. The latter once again demonstrated its significant influence on search engines and brand recognizability. It is important to remember that content marketing brings positive and tangible results only when done right. Otherwise all your efforts have the opposite, counterproductive effect on your business. It is important to remember that if the project is promoted from scratch, tangible growth and results are expected in 6-8 months after promotion. This statistics includes not only this project but dozens of other projects over the past year. With our teamwork and client’s active contribution we achieved great results. Branded traffic is growing and new clients keep flowing, so naturally now the company is able to compete with bigger rivals on the market.